Check out Part 2 of our Search for the Oldest Record Store in the World here. 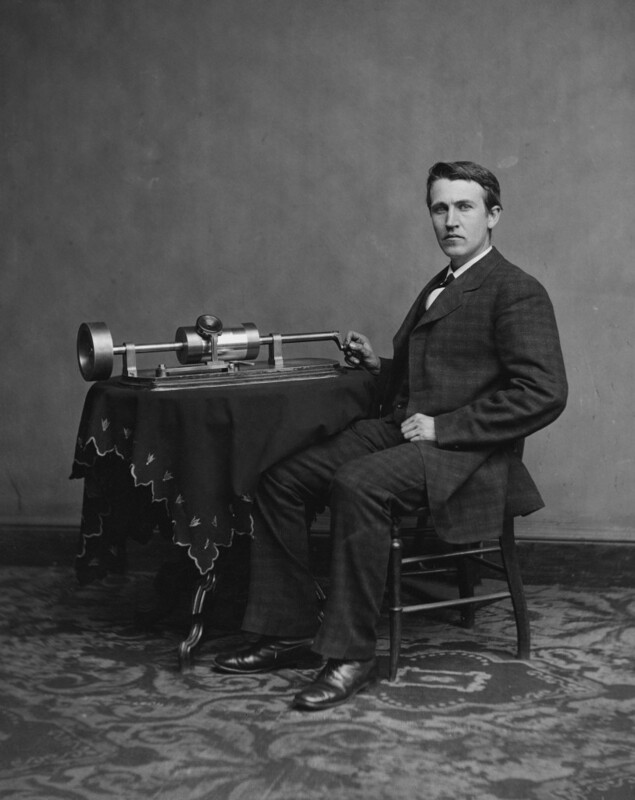 I wonder if Thomas Edison realised what he was unleashing when he created the first machine capable of recording and reproducing sound, way back in 1877. The phonograph, or gramophone as it came to be known, was the beginning of a long evolution for instant musicality in our every day life. From phonograph cylinders to wax cylinders to plastic cylinders, from 10” to 12” vinyl discs and cassettes, CDs and MP3s, there have been many a format to give the people their music. I also wondered if D’Amato Records had seen all of those formats. Anthony D’Amato, the current day descendant of founder Giovanni D’Amato, had told us that they used to sell “the Edisons,” along with the cylinders, around when they had first opened. If they had opened in 1885, they would be among the pioneers of the audio world – the first phonographic cylinders were pressed in 1888, after all. The dates seemed to match up. 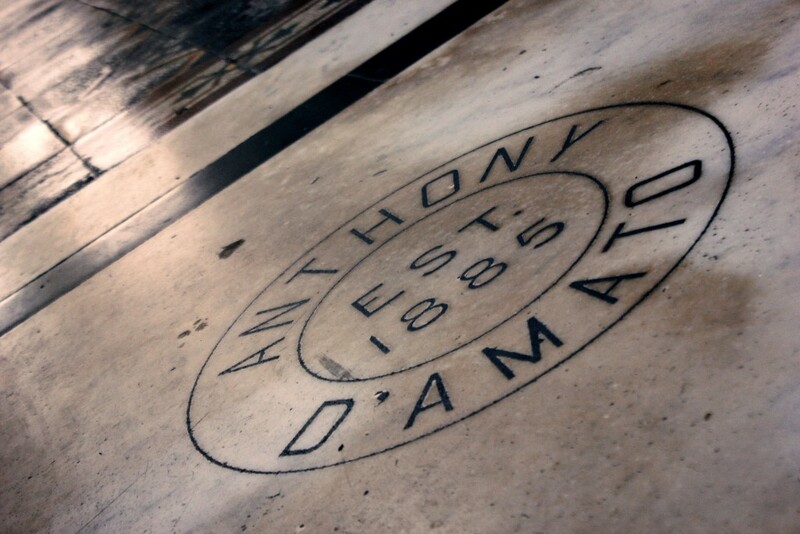 Giovanni D’Amato, born in Italy in 1861, moved to Malta and opened a furniture store in 1885, switched to music items, and died as a merchant in 1913, leaving the store to his son Anthony. 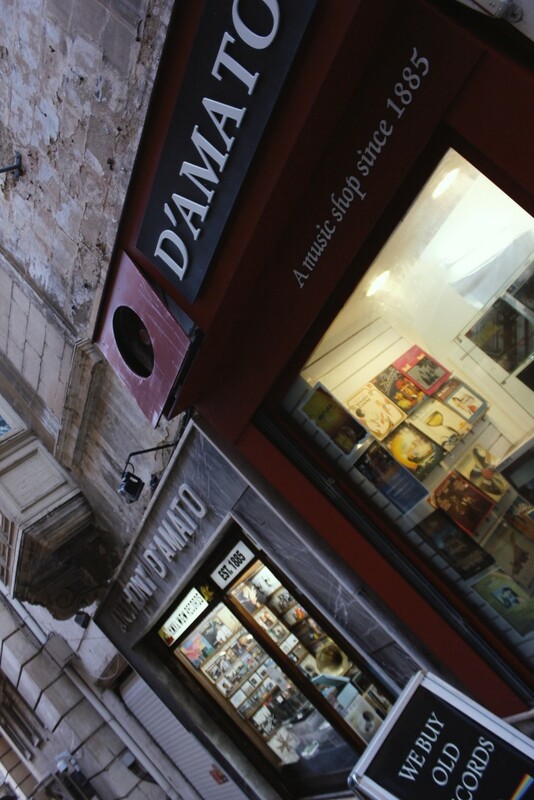 That store still stands today, in its original location in central Valletta, withstanding two whole world wars; unlike Spillers Records in Wales, the current Oldest Record Store in the World, which has moved locations twice. But we didn’t have proof that the store was opened in 1885 beyond the marble engraving at the entrance to the store. We had found Giovanni’s death certificate, and Anthony’s passport – but we never found a dated merchant license. We found gramophone adverts in newspapers from the 1930s, but the archives at the biblioteca, the Melitensia, the Guida Generale, and other resources and publications did not mention any music merchants going by D’Amato at that time. However, with all these documents in hand, and in search of some form of document proving the shop was open, and selling music-related items in 1885, we headed for the last time to the Lands Department. After booking repeated appointments, incessant reminders, and finally getting the green light to speak to a certain David from the Lands Department, we arrived at their door at 8:30am one fine morning. Upon asking for David, however, we were told he had left for court. I couldn’t help thinking, even if they did have a document that could prove D’Amato’s age and business, I’d probably have a better chance of carbon dating the store’s humid hump (see part 1) than finding said document. After asking to speak to the director, and being told “he’s the director, I cannot just call him,” then “the director said your appointment is with David not him,” and a couple of emails, a very courteous David appeared, ready to help us solve the puzzle. We went to his office where he asked for D’Amato’s store address. With the address, 98/99 St. John’s Street, he made a couple of calls asking for the property’s tenement number, and to get the file with D’Amato’s said tenement number. 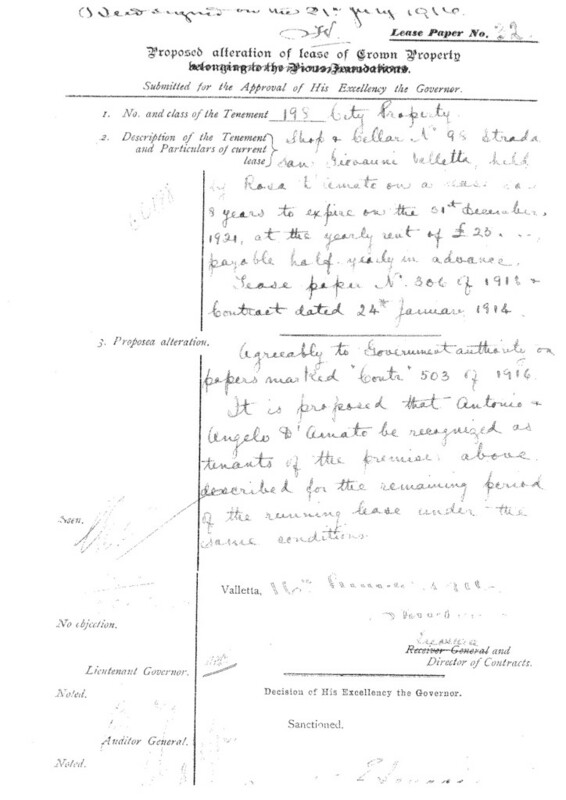 We opened the file together, and the date looked back at us – the government ground rent renewal contract denoted 1913. It was renewing the property for another 8 years to the D’Amato family. “You should try your luck with the Public Works department,” he offered. The receptionist at the Public Works directed us to a semi-blind, elderly man, who, upon hearing what we needed, unfurled a huge ancient map of Valletta that he had handy, and proceeded to look up the tenement number (198) again. We found it on the map. Yes, very good. We looked for the files with this number. We found two. I could feel my heart beating really fast as we turned the pages – I was going to throw up all over this map. Lucky the guy was semi-blind, I suppose. In one file, dated 1912, we found the plans of the shop. In the other we found another lease contract document, this time dated 1952, under the name of William D’Amato (essentially when the leasee was changed to Anthony’s nephew, William, the current Anthony’s grandfather). And that was as far as the paper trail went. 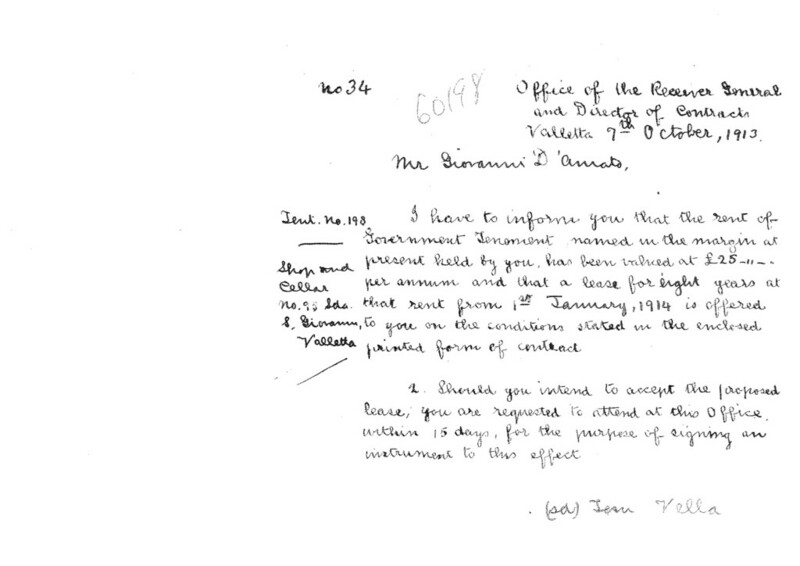 It means that the earliest public records show that D’Amato definitely owned the shop in 1912. 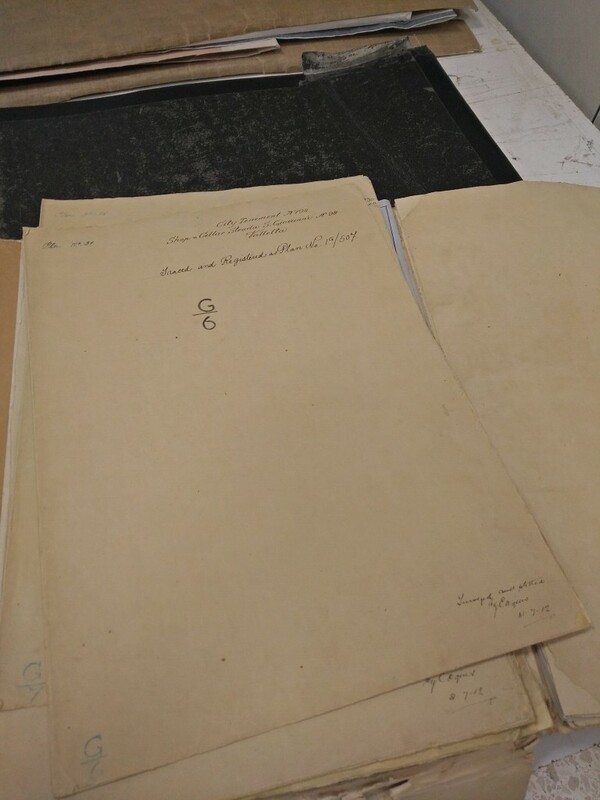 We couldn’t, however, find any document from 1885. This doesn’t mean that the shop didn’t exist in 1885; it did, but it could have been anything, a sweet shop, flower shop, tobacco shop…or a furniture shop, as the D’Amato family claims. It was also a renewal contract, not the first ground rent contract. So if Giovanni D’Amato was renewing his lease, say, every 8 years, he may have opened the store in 1905. If this wasn’t the first renewal, and there are others which may have been lost, stolen or misplaced, then we get closer and closer to the 1885 date. The fact that the renewal contract exists, yet any document showing D’Amato actually obtaining the store and opening his business was not found, is unfortunate, and quite frankly, a bit suspect. Giovanni would have been in his mid-20s in 1885, and we knew he had gotten into a spot of trouble with the courts over “the movement and buying and selling of goods” in 1889, which implies he was already involved in commerce at that time. The location was a store prior to 1913, and did belong to the D’Amatos, and has ever since, never moving locations or changing owners. The renewal document exists, meaning there was a document stating that Giovanni D’Amato began leasing the store at some point. However, that document has either been lost to time, been stolen to hide the details, or been misplaced in another tenement’s file. If that document does exist however, showing whether D’Amato had entered the store in 1885, or 1905, it would be tangible evidence of being the oldest record store around. Although Spillers Records in Wales claim to have opened in 1894, the shop owners moved shop as many times as D’Amato Records has weathered World Wars. The oldest record store in the USA is Rinehart’s in Missouri, opened in 1897 selling wax cylinders and Edison Phonographs, but has had to switch to selling DVDs and video games in the last few decades to stay afloat. Second to that is George’s in Pennsylvania, founded in 1932, putting Europe ahead of the rest in terms of pioneering selling records. Does this mean that, technically, D’Amato Records still may be the Oldest Record Store in the World that has sold music consistently, and remained in the same spot, since first ever passing some wax over their cash register? Probably. 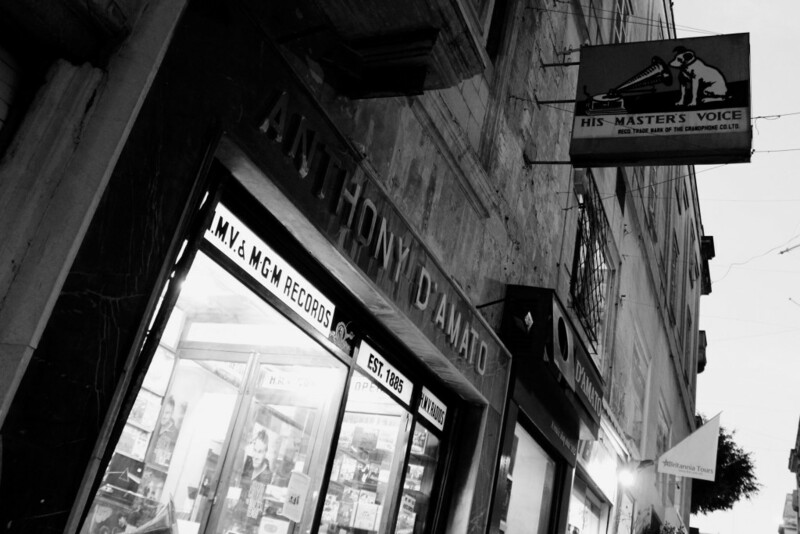 Either way, D’Amato Records, just off the main boulevard of Malta’s capital city, has been a source of music for just about a century now. If it’s not the oldest record store in the world, it sure is the sturdiest. 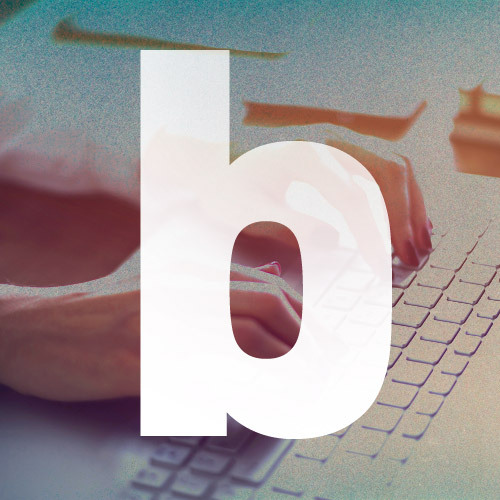 Special Thanks to Ben Vincenti, Cain Farrugia, Noel D’Anastas, Doris Vincenti, Graziella Calleja & Gloria Anievas.